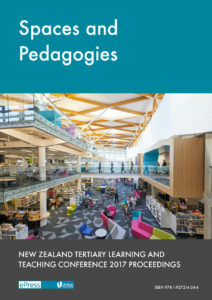 Spaces and Pedagogies, the 2017 New Zealand Tertiary Learning and Teaching Conference, was held at Unitec Institute of Technology in Auckland on 2-3 October. The event explored how the spaces that we teach in, whether real or virtual, cultural, social, commercial or otherwise, could be best designed for our learners. Conference strands delved into the design of learning environments and learning practices, with particular attention on how they reflected our students’ lived experiences, catered for our students’ practices, realities and traditions, and met the needs of employers and other stakeholders. Edited by Lucy Patston and Simon Nash, the proceedings published here sample the myriad of papers presented by 170 delegates, and features a full list of abstracts. Click here to read these proceedings.